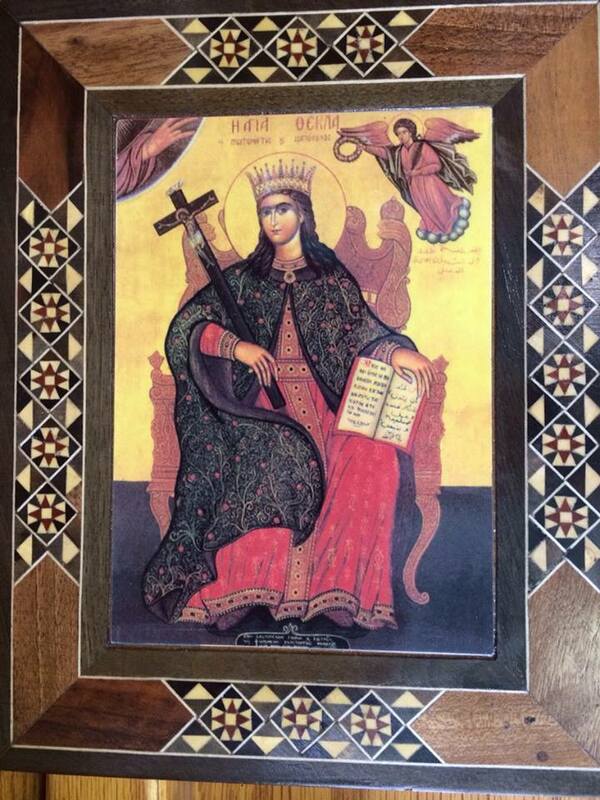 The icon of St. Tekla decoupaged on a wood inlaid frame. I heard the story of St. Tekla (Taqla) while having tea and coffee with my traveling companions in Damascus, Syria, this past January. We had journeyed to Lebanon as partner churches of the National Evangelical Synod of Syria and Lebanon from the U.S., Sweden and Switzerland, to hear how the church is dealing with the war in Syria, now in its fourth year. 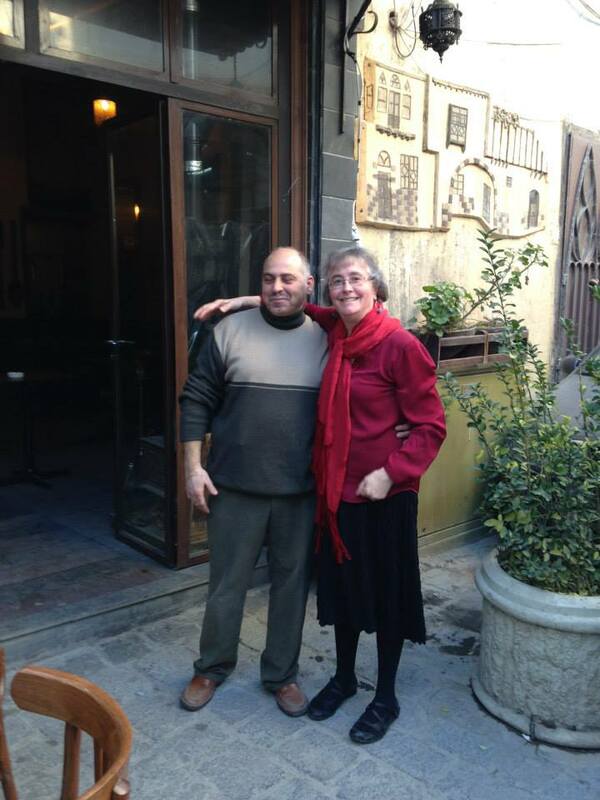 As part of this encouragement trip, sixteen of us traveled to Damascus on the highway from Beirut. As you can imagine, the journey was a lonely one with very little traffic, most of it going the other way to leave Syria. Just like the coffee, tea and sweets at the border and in the president’s office, this story was told over coffee and tea at a table on the street outside the house of Ananias. Some of our cohort had been shopping for local crafts in a small craft store right next to the house of Ananias. Indeed, we had shopped there more than three years earlier on another trip, that one made just months before the Arab Spring and all its aftermath, including the war in Syria. Elias in his then craft shop with the inlaid box he made and I bought for Steve, signed on the bottom by Elias. On that trip we had shopped in that same store, and as it was small, after making our purchases left the store to make room for others. 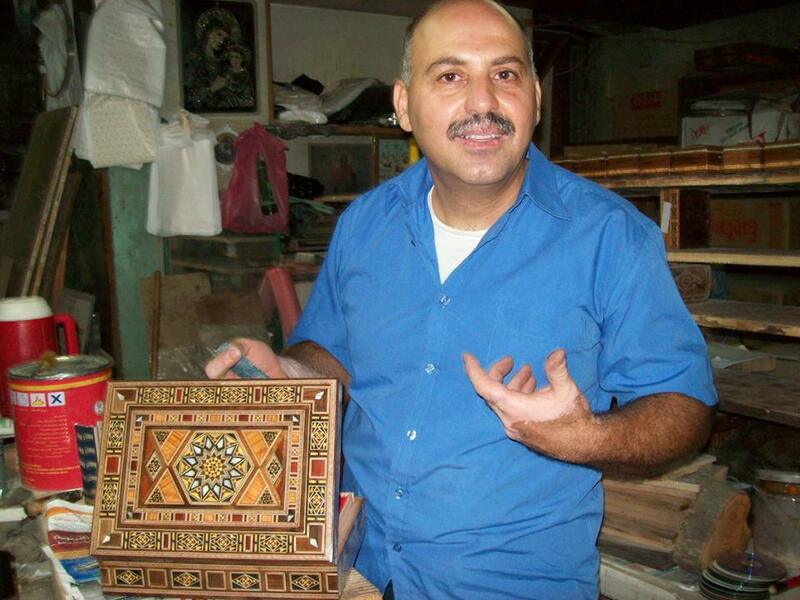 My friend Sue and I walked just across the narrow street to another craft shop and met Elias, who showed us how they make the beautiful wood inlay on boxes and crosses and backgammon sets, souvenirs to bring home from this ancient city. I bought a box for my husband and had Elias sign the bottom. It is a treasured possession! As we were sitting out on the street, enjoying the tea and coffee served by the friendly shopowner, it struck me that he and the shop looked familiar. It was the same shop! Our server was Elias, the woodworker, only now due to the war there are no tourists to buy his wares, just some random Christians from another land sitting at his table while mortars exploded in the distance. His life has been reduced to selling coffee and tea to area residents who wander by. I was so excited to see him again that I jumped up and overwhelmed him with an embrace. His smile spoke volumes and though I don’t speak Arabic and he doesn’t speak English, we both understood the other. Elias and me on the street outside what is now his coffee shop. As we continued to sit and enjoy the beverages, Elias went back in the shop and brought out a dusty laminated icon. Yes. It was St. Tekla. That was how I heard her story. I wanted to pay him for it and he refused. It was a gift. Another in the party suggested I could get an authentic icon at an antique shop. But that’s not what I wanted. I had been given this gift by my brother in Christ and therein was its value. Because of this brother, I learned St. Tekla’s story. And now you know his story. And his name…Elias. Thanks for sharing! I love stories like this. I am so glad you were brave. No problem. Your writing lacks nothing! Good job. Thank you, Kathy. I hope you will think of Elias when you see Syria on the news.